How can we help solve your problems. 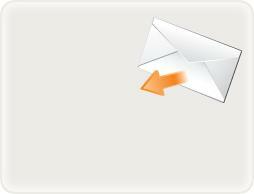 repair equipment, click here for more. Examples of some various company projects and patents. 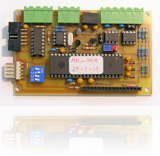 Our speciality is the design and development of embedded microprocessor control systems. In most cases we work with our clients to decide on the future direction for their product range, and advise them on how embedded controllers can simplify their needs, making them more flexible with software changes and updates. We design the circuit boards and the rest of the control box assembly, make the circuit boards in-house, and assemble all the equipment. Finally the software is written and debugged, and the client receives a fully working unit designed specifically for their products. Where the clients production requirements are small, we will manufacture limited quantities of units for them. In the design of these units, much of the interface circuitry is analog, and power switching. 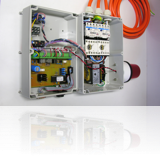 We have many years experience in analog techniques, as well as small and large DC power supplies, and motor drive systems. We have been designing and upgrading their products for the last 20 years. The current cathodic protection control system uses a four line alphanumeric display with ‘soft key’ menu selection and the control PCB uses an ATMega16 processor. Western Power: Kwinana Power Station. A common problem today is when spare parts are no longer available for obsolete equipment. We were asked to design and supply replacement PCBs for their obsolete furnace propane igniter PCBs. Design and supply motor drive control and hydro-foil angle indicator system for a marine hydrofoil. The control electronics and indicator panel were mounted on the fly bridge, with the motor and control system in the engine room. (ATMega32 processor). ‘Ship arrives at oil refinery and oil is refined into different products’. This display had been started by someone else, who had tried to use a simple interface board, designed for hobbyists, with a Mac computer. There just were not enough inputs and outputs and the Mac computer had to be manually booted each day. We designed, supplied and installed two rack mounted modules. One was the sequence controller, using an ATMega32 controller, which monitored all the motion sensors and pushbuttons for the display, and switched all the lights on and off in the required sequence.The second module (also using an ATMega32 controller), sequenced the pre-recorded digital audio recorder chips in time with a persons progress through the display.